Prime Minister Manmohan Singh on Thursday affirmed India’s commitment for a political solution to the Sri Lankan Tamils issue during a meeting with TNA leaders, who would now consider joining a Parliamentary committee provided Colombo assures they will not be “cheated again“. Dr. Singh also told a TNA delegation that India will not “backtrack” from its position that Tamils in Sri Lanka should lead a life of “dignity and self respect” in a peaceful environment, the team’s head R Sampanthan said. The Prime Minister said India would continue to engage with the Tamil National Alliance in its efforts to find a political solution to the decades—old Tamil question. During separate meetings with Singh and External Affairs Minister S M Krishna, Sampanthan said the TNA would consider joining the Parliamentary Select Committee on finding a political solution provided Mahinda Rajapaksa Government gives a firm assurance that they would not be “cheated again“. Terming the meeting with Dr. Singh and Mr. Krishna as “extremely good”, he said the TNA told the Indian Prime Minister that the party was committed to achieving a political solution but would want an assurance from the Sri Lankan Government that the “negativity” would be removed. “Prime Minister said India would never backtrack from its position that Tamils in Sri Lanka should lead a life of dignity and self respect in a peaceful environment. 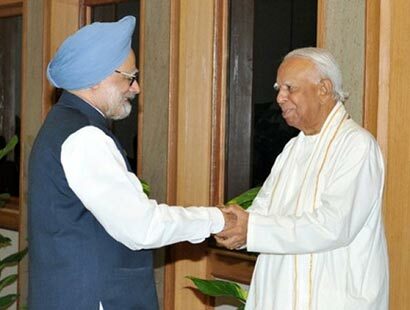 He told us that India is fully with Sri Lankan Tamils and would continue to engage with TNA,” Mr. Sampanthan said. During the meetings, the Indian side also explained its position and how it was working with the Sri Lankan Government in implementing the 13th Amendment plus approach which envisages devolution of power to Tamil—dominated provinces, sources said.